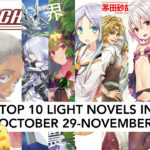 Here are the Top 10 Light Novels in Japan for the week of November 19-25, 2018. Only two titles survive from last week’s list, and the top seller this week? Man, it crushes everyone! An anime adaptation is currently airing. It is set to cover volumes 1-5 of the series, while a film releasing in 2019 will adapt the final 2 volumes 6-7. Novel adaptation of the film of the same name. Which itself is based on the 11th volume of the Gundam Unicorn novel series. 22 episode anime series covering volumes 1-4 available on Crunchyroll. A feature film is coming in 2019. Based on information available, it might cover volume 5. Appears to be short stories set within the main series’ timeline. Original series is complete at 13 volumes. 25 episode anime aired January 2015-June 2017. A Film is set to release in 2019. The manga is licensed for English release by Seven Seas. Volume 5 released in November 2018. Anime adaptation – 12 episodes covering the first 5 volumes. Licensed in NA by Funimation. Here are the Top 10 Light Novels in Japan for the week of November 12-18, 2018. Licensed for English release by Seven Seas. 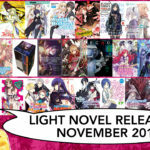 The 5th volume releases in eBook format in December 2018. Licensed for English release by Yen On. Volume 1 is currently available. The series is officially being released in English by Yen On. Licensed for English release by Yen On. Volume 7 will be released January 22, 2019. 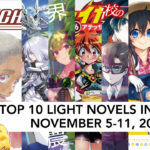 Here are the Top 10 Light Novels in Japan for the week of November 5-11, 2018. A new top light novel this week, though it’s not too shocking. No English license for this light novel series. 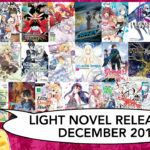 No English license for the Light Novels. 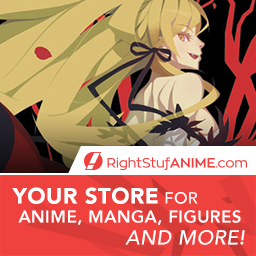 The manga is being released on Crunchyroll. A 13 episode anime aired July-September 2017. Licensed for English release by Funimation. The anime covered up to the 5th volume of the light novel. 1st new volume in 18 YEARS! 104 anime episodes over 5 seasons. The first & last 2 seasons are on Crunchyroll. The first 8 volumes of the series were covered by the anime. 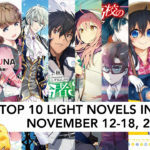 Here are the Top 10 Light Novels in Japan for the week of October 29 to November 4, 2018. Another week where only 1 title manages to survive from last week. And a list that proves funny still sells very well! Licensed for English release by J-Novel Club. They released volume 17 on November 4, 2018. No English license for this series. Main series licensed by Yen On. No License for this spin-off. 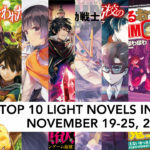 Here are the Light Novels releasing during the month of November, 2018. 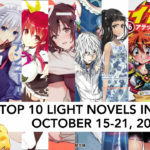 Here are the Top 10 Light Novels in Japan for the week of October 15-21, 2018. The third season of the anime adapting the parent series is airing now. Licensed for English release by Yen On. Volume 5 released September 18, 2018. An anime adaptation is currently airing.